New Stand for Japanese-type Clamp-on Machines - A stand has been developed to replace the old Black Sawhorse stand used for Japanese-style machines. The new stand is based on the Eurostand so it is rock solid, except it is shorter. It's at the sitting height we are all used to. The big bonus is that there are no "legs" or "hardware" for the knitting to catch on. The table top is easy to clean. You can also put the lid of the knitting machine away in the closet because the tray in the back of the stand will hold all the gadgets. A link to this same stand customized. 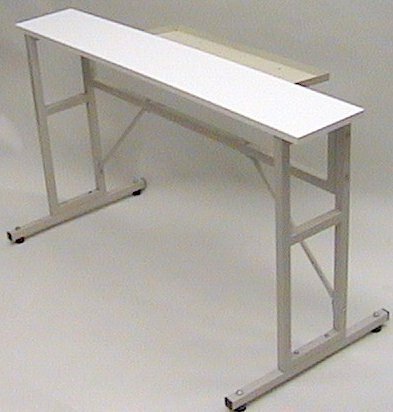 This is the standard Japanese knitting machine stand that all have always been familiar with. 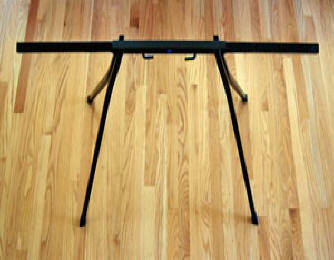 In the past, the center of the stand allowed it to tilt, but the tilting mechanism is no longer available. Assembly is extremely easy because all that is needed is the insertion of the four legs into the openings on the cross bar, the insertion of the 'L' bars that will hold the machine box top and the addition of the four rubber feet.